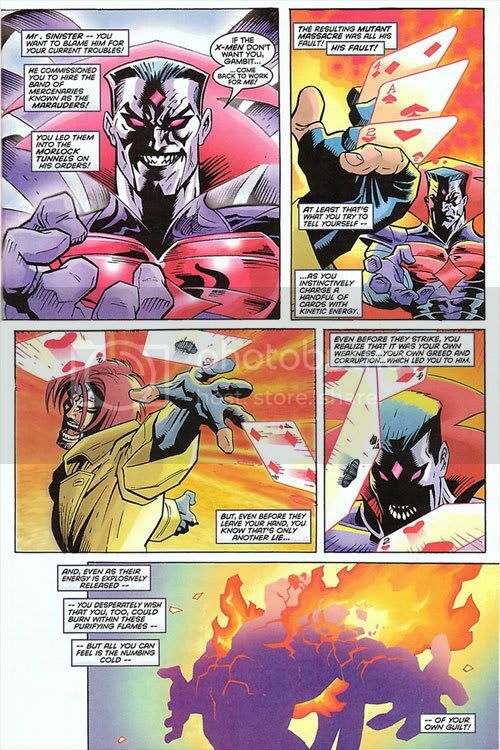 Character » Gambit appears in 4029 issues. i have come to the conclusion he really is growing on me. I never really like or disliked him. But recently ive been reading his series thouroghly and...dammit i like the guy. Hes such a glutton for punishment both physically and mentally. He needs to stay in "where am i at?" limbo for now. Cause that is were i think he is at his best. "Where i am at?" meaning he doesnt really knwo where he should be in the world. 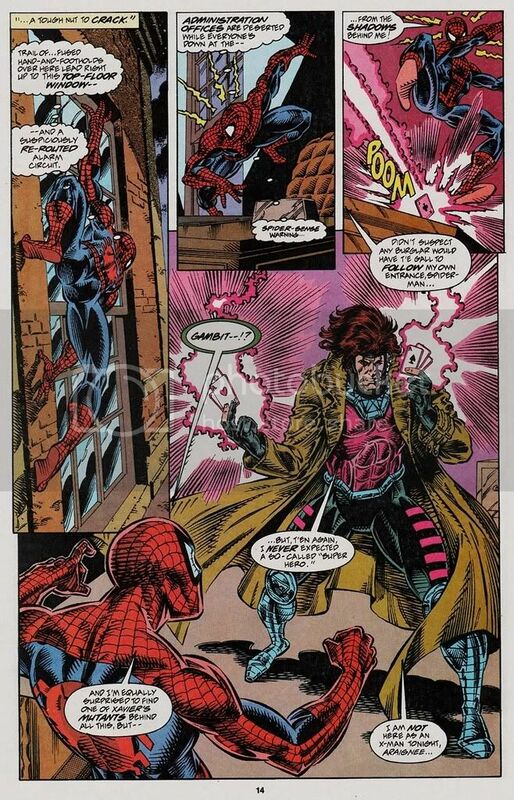 I like Gambit.I just got some of his old comics and there are pretty good. Damn Sinister.I thought he was smarter than that lol. This is the only version of Gambit i liked. He was badass. Yeah he was. Exile Gambit was the sh!t. How'd I know you post here lol. Also did you guys know Gambit has a calming type effecton people? Not as good as runners lol his effect actually makes people like them if he can uses it in the right way. One character mentioned this. (Oh yeah, Don't steal that scan. I'm gonna use it soon)"
Respect Gambit and his cajun-ness. Gambit has been my favorite since I was little. "Gambit has been my favorite since I was little." It's the Cajun accent isn't it? It's the Cajun accent isn't it?" I didn't know he had an accent back then,i think it was just his swag...if that makes sense lmao. I didn't know he had an accent back then,i think it was just his swag...if that makes sense lmao." I get you.I like him because I thought the whole card thing was unique. its not a girls color. its not a girls color." they drew me in to him. thats also why i liked Psylocke and Jean. I'm waiting for Gambit to pimpslap someone and blow their face off. It would be the perfect display of his new ability. Oh, he should so do that to Wolverine. Shaking hands with someone and threatening to blow them up would also be cool.